Make Any Amp Sound Better! 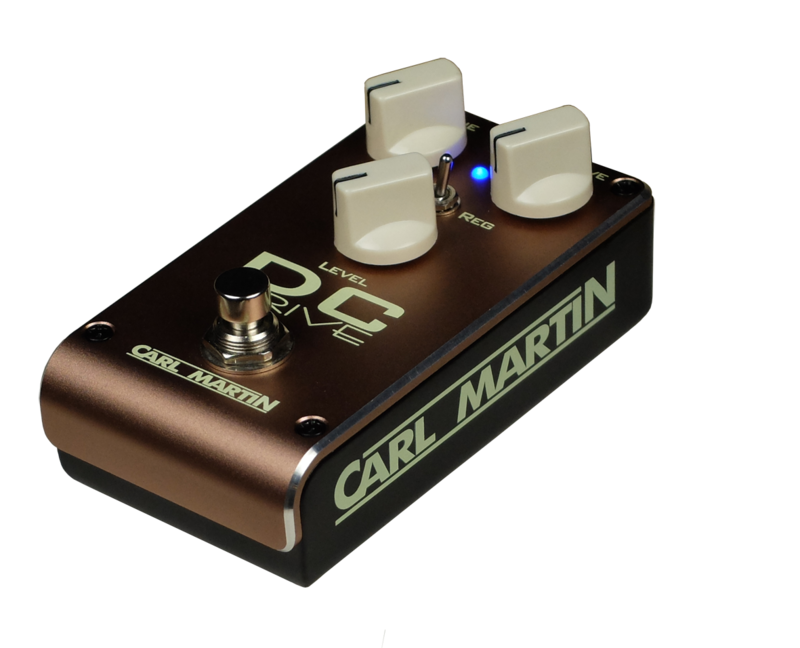 DC-Drive 2017, Other guitar saturation effect from Carl Martin in the Vintage series. Below is a video demo that utilizes a Taurus amplifier, but also various amp simulations (via Positive Grid’s Bias 2), and later the Carvin Legacy (Vai) Drive. After listening I would be surprised if anyone cannot hear how the gear influences how the DC Drive interacts and vice versa. For instance, an Orange amp sounds like an Orange amp… but with the DC Drive it’s like an Orange on steroids or with some added personality. The same is true of a Marshall, Fender, etc., and I must add how responsive Fender amps are with the DC Drive… very impressive, as are Marshalls on their clean channels. When it comes to high-gain or Metal type amplifiers, turning on the DC Drive low (e.g., quarter way) often is more than enough to add additional grit, grind and definition to the notes… a little goes a long way and makes the tone stand out in the mix even more. The controls are very straight forward, with an ON-OFF switch, and a VOLUME, TONE and DRIVE knob. Surprisingly there are times when the Tone should be turned down quite a bit, for more bass response (typical with Orange amps, since they tend to be a bit more harsh or trebly). For other amps, as well, there tends to be a sweet spot, although I’ve found between 11 and 1 o’clock a typical range with very flat and clean sounding amps. The Drive does increase volume to some degree, and so you may have to back off the Volume knob a touch. The REGULAR/FAT switch is a very nice addition, particularly with amps that are a bit more trebly. The Regular setting is more flat and provides a typical overdrive, which ranges from slightly overdriven/distorted, to crunchy to sizzling hot. The Fat mode provides more bottom end (and some added mids) while boosting the signal slightly – the tone is more in-your-face as you feel and hear the ‘push’ generated… this mode is great for amps that sound a bit thin and less robust or if you want a more modern and edgy sound. This is a new 2018 release – a revamping of the original DC Drive in a smaller footprint. The DC Drive is one of those straight forward pedals destined to become a classic, and I don’t say that lightly. I am thorough impressed how it encourages and brings to life the individual characteristics of the guitar and amp being played, thereby producing unique results from one guitar or amp to another… but without any extraneous coloring. 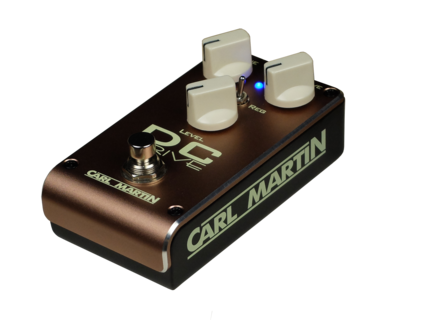 The DC Drive is not difficult to use, and I suspect the biggest tweak going on with this pedal will be to match the Tone output of the pedal with that of your amp (presuming you want a similar, but beefier flavor). More shrill or trebly amps need the Tone knob turned down, whereas darker amps respond very nicely to increasing the Tone. As indicated, adjusting the Tone will maintain a particular amount of bass/mid/treble, but of course you can adjust to achieve a different effect (more bass or more treble than the original amp’s tone). The Drive also will require tweaking based on personal preference. Just a hint of Drive is more than enough if you want to give some edge to your Blues or Country licks , whereas pushing it beyond 2 o’clock begins getting into high-gain territory; right around 12 o’clock offers some very classic sounding Rock drive with many clean amps. And once you get into high-gain, Metal and insane type amps, having the DC Drive turned on low and in front of your chain adds that extra dimension in the tone – not unlike the effect an EQ or servo drive can have. The DC Drive comes in a two-tone anodized die cast housing; it has a metal foot switch (for on and off) and plastic knobs. The foot switch is somewhat close to the plastic knobs (due to the compact size of the pedal), but you would have to be rather careless to stomp on and break the knobs. The Fat/Reg switch is housed within the three knobs and well protected. The standard 9v 40mA power input is located at the back, as are the cable input and output. You cannot use batteries with the DC Drive.